Just after the Last Supper, the disciples show their humanness by immediately having an argument on who is the greatest. Evidently they have utterly missed the point of Jesus’ teachings on service and humility. When he hears their debate, Jesus reminds them that the greatest among them “must become like a person of lower status and the leader like a servant” (Luke 22:26). In the gospels, Peter often serves as the “representative disciple”, meaning that he symbolizes the questions, successes and (mostly) failures of the disciples—of The Twelve and of all us. Immediately after Jesus reminds all of the Twelve about “true greatness,” he turns to Peter and says, “Simon, Simon, look! Satan has asserted the right to sift you all like wheat. However I have prayed for you that your faith won’t fail. When you have returned, strengthen your bothers and sisters” (Luke 22:31-32). This is a harsh but very true statement that holds as true for us today as it did for Peter. Sifting is not easy. Sifting separates the good from the bad, but it is seldom pleasant. If for nothing else, sifting reminds us that inside us there is both wheat and chaff. Most of the time we don’t want to be reminded that we are not all perfect, but Jesus here reminds the “representative disciple” that it’s sort of inevitable, that some kind of breaking or humbling is going to come Peter’s—and thus our—way. Interestingly, Jesus tells Peter that he has prayed that his strength won’t fail. It’s reminiscent of Jesus’ words in the Lord’s Prayer: “Don’t lead us into temptation” (Luke 11:4b). In Matthew’s version of the prayer, Jesus says, “Don’t lead us into temptation, but deliver us from the evil one.” There is a sense in Jesus’ teachings that temptation is a given. Avoiding it is not the point, but enduring it is (otherwise, he wouldn’t have to add, “but deliver us from the evil one”). So with these words, Jesus is saying that reflection, humility, and even a bit of failure is inevitable for a disciple, but Jesus will be praying that we find our way through it. 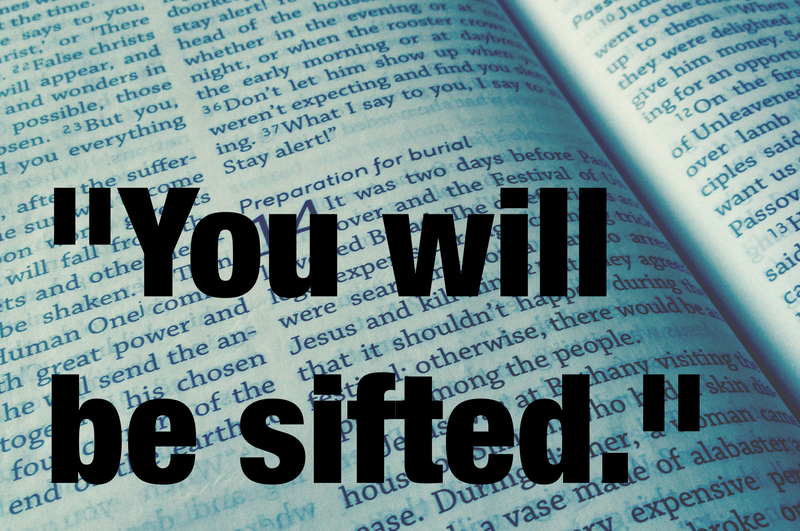 We need to be “sifted”: to examine ourselves and see what’s good and bad in our inventory, and then be prepared to respond appropriately. We need to rely on Jesus’ strength to help us endure the humbling that sifting involves. After we get done with our inventory, and come to terms with the “chaff” in our lives, we are called to service. Next up: Jesus gets out the pruning shears.